To integrate Watson portlet application with the virtual portal in IBM WebSphere Portal server. 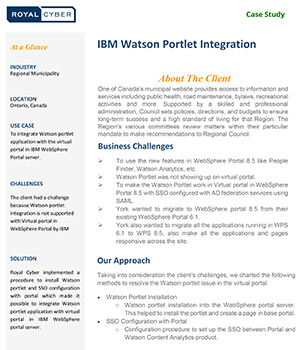 The client had a challenge because Watson portlet integration is not supported with Virtual portal in WebSphere Portal by IBM. Royal Cyber implemented a procedure to install Watson portlet and SSO configuration with portal which made it possible to integrate Watson portlet application with virtual portal in IBM WebSphere portal server.